Dana, a World Link Future Leaders Exchange (FLEX) student from Kazakhstan, has exuded passion and zeal for all aspects of the exchange program from day one. She is an exceptional student and active member in school clubs and sports. She has shown her commitment to sharing her culture by giving 20 presentations since her arrival. Dana is clearly enthusiastic about volunteering as she has accumulated an astounding 103.5 volunteer hours! 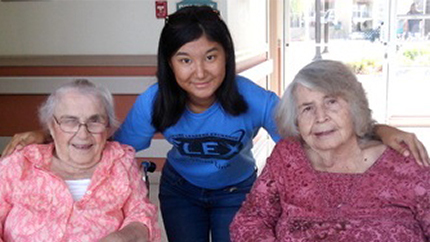 Reading books, playing bingo, and spending time with residents at the local senior rehabilitation center are Dana’s favorite ways to volunteer – and her favorite place to do them. In December she and her fellow Leos Club members threw a Christmas dinner party for the residents. Dana took this opportunity to not only spread Christmas spirit, but also to share some information about her culture. For the party, she brought in some traditional Kazakhstani salads for all the residents and talked about her holiday traditions. The residents loved it! Dana is devoted to two other school clubs she has joined, the Future Farmers Association (FFA) and Key Club. In FFA, she participated in activities like selling tickets to the 500 Tri-Tip Drive-By Dinner and setting up for a banquet that served 400 people. Her commitment as an active new member earned her a FFA Greenhand Degree. In Key Club, she volunteered at fundraising car washes and sold candles for donations. Dana has amassed the rest of her volunteer hours by promoting local blood drives, assisting at school sporting competitions, and joining in events with her cluster like Toys for Tots. On top of all this volunteering, Dana joined her high school’s JV tennis team and won the “Most Inspirational” award. Dana recognized that domestic violence is a big issue in this country and decided that this is the issue where she wants to make a difference and she has chosen it as her Global Youth Service Day project. She has already started working with the local women’s shelter and by October, Dana had begun making flyers for her fundraising event. In November, she participated in King County’s Youth and County Government Day, where she used her public speaking skills to introduce and promote her GYSD project to the Board of Supervisors. We know with all the hard work she has put into this event, it will be a huge success!